In just a couple of days, it’s going to be 2013. I’d like to know… what are YOUR plans? Would you like to have great energy and feel fantastic in your body over this Holiday season and years ahead? Today, I have something REALLY cool to share with you. Many women have one thing in common: they are frustrated with how they look and feel. They want a solution that is simple to follow and will finally WORK for them after getting disappointing results with many diets and fitness plans that had failed. What they are often UNAWARE of is that an undiagnosed underlying thyroid condition can sabotage their efforts and make them feel fatigued, depressed and exhausted. Did you know that thyroid disorders are on the rise and are becoming very common? Hypothyroidism affects 5 times more women than men and half of them remain undiagnosed. 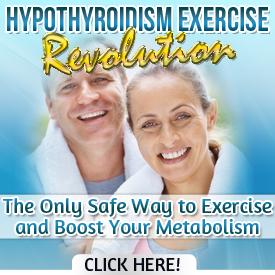 About 90% of hypothyroidism is due to an autoimmune condition called Hashimoto’s disease. It can actively contribute to a wide range of unexplained symptoms, food sensitivities, digestive problems, fatigue, weight gain, depression and joint pain. You should listen to your body and do not ignore your symptoms because it is your body’s way to tell you that something is wrong. Often pain signals presence of illness, either emotional or physical but it is also can points to area that is begging for repair. Our thoughts powerfully influence health of our minds and bodies supporting or preventing us from healing. You should not accept fatigue, weight gain, hair loss and luck of motivation as a part of “getting older” or “just in your head”. All these symptoms can point to undiagnosed thyroid condition. Unfortunately, it is very common that you can suffer from hypothyroid symptoms, but your doctor is telling you that your labs are normal and there is nothing wrong with you. The truth is that the lab tests do not always tell you the full story and help to make a diagnosis of hypothyroidism until you have the correct labs and tests run. All this said, doctors rely on measuring TSH to asses thyroid function. Many doctors will even prescribe thyroid medication based on TSH alone. If you got checked your TSH only you may have an autoimmune thyroid disease such as Hashimoto’s but do not know it! In fact, any thyroid drugs just replace the missing hormones and do not address the cause of thyroid imbalance. How can you treat hypothyroidism effectively if you do not know what causes it in the first place? No wonder that most people who take thyroid medication such as Synthroid continue to have hypothyroid symptoms. I want to help you reach a higher level with your health – to help you finally feel energetic, lose some weight if you want to and LOVE the way you look. There are ways how to heal your thyroid naturally without using prescription drugs and costly supplements. I want to share with you an infographic where you can in simple and an entertaining way learn about thyroid disorders and how you can transform your body and feel vibrant and energized again. See if you can recognize your symptoms and if you do, have a look at the offered solution how to heal your thyroid naturally that is based on research and many years of hands-on experience of a Holistic Health Coach who specializes in thyroid conditions. It could be a real tuning point for your health and energy levels after you would be able to identify the root causes and hidden stressors that are behind your symptoms. Many people and even doctors seldom consider diet as an important factor for arthritis, joint pain and autoimmune thyroid conditions such as Hashimoto’s disease. Instead of immediately medicating ourselves with thyroid medication, we should examine why we have hypothyroid symptoms, pains and aches. The foods you eat will either fuel your recovery or worsen your disease and symptoms. Many foods that are considered to be healthy are actually not good for your thyroid. In fact, most triggers of Hashimoto’s disease are dietary and you can improve or even recover by supporting your body with individualized nutrition and lifestyle plan. FREE Hypothyroidism Seminar is an online course that is offered by a Functional Medicine Practitioner who completely recovered from Hashimoto’s disease and hypothyroidism and went through a simple yet powerful transformation: from sickness and despair to healing and freedom. The seminar is about why you don’t heal and how to use the right foods to support and heal your thyroid naturally. In most cases Hashimoto’s disease and hypothyroidism are the result of a complex of causes and it cannot be helped by addressing a single factor. This seminar will help you to learn about the most important factors that prevent you from getting better and are most likely to be overlooked by your doctor.